Near infrared fluorescence imaging (NIRF), a core technology in PINPOINT, has been shown to positively assess perfusion in tissue during surgery. Proper tissue perfusion is considered a critical contributor to acceptable clinical outcome. PINPOINT is the world's only HDTV endoscopic fluorescence imaging system that deliver real-time visualization and clinically relevant information related to tissue perfusion and anatomy. Simultaneously view anatomical structures in state-of-the-art HDTV while visualizing tissue perfusion and anatomy in fluorescence mode. Visualize blood flow in vessels and tissue perfusion when it matters most-during surgery. 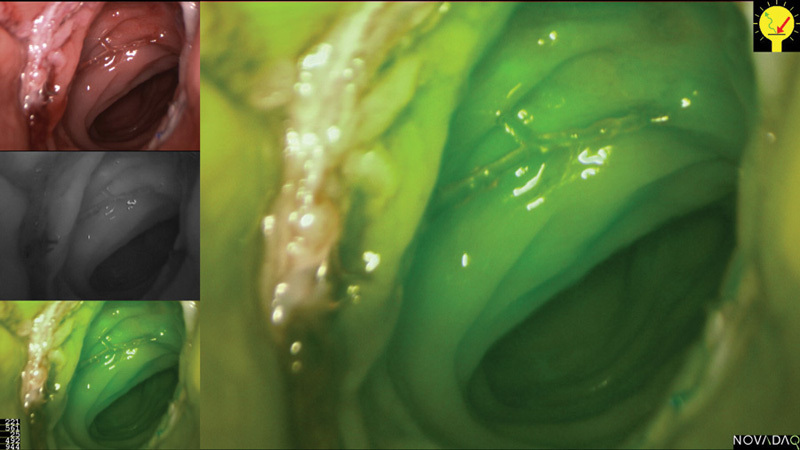 Embrace the pathway to perfusion assessment and anatomical structure identification through the use of PINPOINT's core technology, SPY fluorescence imaging. The use of SPY imaging technology has been shown to reduce post-operative complications and lower hospital costs in a variety of surgical applications. Convenient buttons on the camera head toggle between various imaging modes including HDTV white light mode, NIRF mode and a never before seen PINPOINT mode that combines both white light and NIRF into a completely new minimally invasive visual experience. No need to alter your surgical technique as set-up and utilization is similar to other minimally invasive video systems. The latest optical and light generating technology maximizes brightness and camera sensitivity, while greatly reducing both energy consumption and heat output.